Mr. Kyrylo Loukerenko is the Executive Director and Co-Founder of Hromadske Radio (“Public Radio” in Ukrainian language), a leading public news broadcasting service that provides timely and balanced news on current affairs in Ukraine. From 2012 to 2013, he worked at TVi TV channel, one of the few voices of responsible journalism at the time, serving as editor of a weekly TV magazine and co-presenter of the daily show “Znak Oklyku” (Exclamation Mark), covering Ukraine’s widely criticized 2012 parliamentary elections, among other topics. In the early 2000s, he worked as a producer and special correspondent for the BBC’s Ukrainian Service in London and Kyiv. 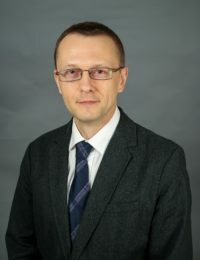 During his fellowship, Mr. Loukerenko researched public media in the United States and used his findings to draw a roadmap for a sustainable public media environment in Ukraine. He worked on disseminating his findings in two formats: a report on policy recommendations addressed to legislators and public media and a pamphlet addressed to ordinary citizens, to be published on hromadske.radio.